Even after a five-year run, multifamily assets remain the hottest commodity among all primary property types. With a 1% gain preliminarily in August, small multifamily asset prices have returned 7.9% year to date and a sizable 10.1% compared with 12 months earlier according to our latest research. Such properties, defined by transactions with a value under $5 million, largely represent the affordable rental housing stock for lower-income households. The rising price trend for smaller multifamily assets reflects strong tenant demand that comes from different directions. Low inventories of for-sale homes have driven single-family housing prices beyond the means of many first-time buyers. Also, many millennials simply prefer rental apartment living and have thus postponed single-family home purchases. Small multifamily prices have also been bolstered by wildly successful small balance lending programs sponsored by Freddie Mac and Fannie Mae whose attractive financing has whetted investor appetite for small apartment buildings. 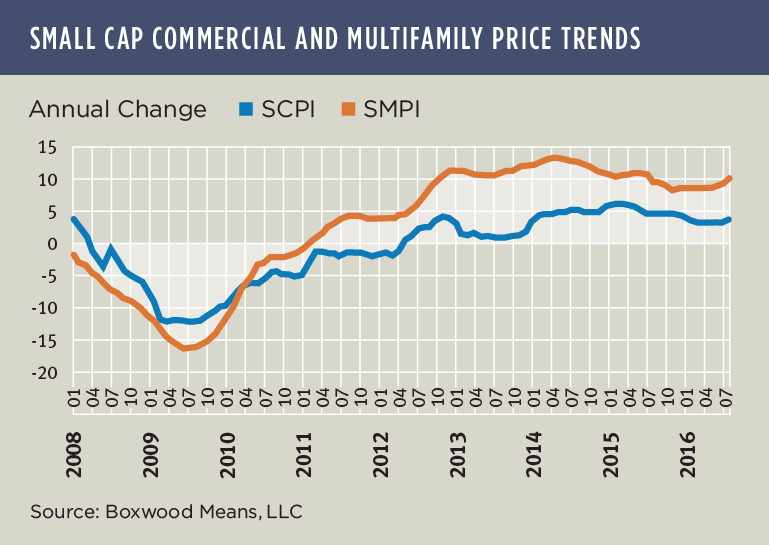 With these unusual forces at play, Boxwood's national Small Multifamily Price Index (SMPI) has soared relative to the Small Commercial Price Index (SCPI) comprising small office, industrial and retail properties (see the nearby graph). SCPI rose 0.6% in August on a preliminary basis but is up only 3.7% year over year. And while SCPI has slowly retraced its losses to within 6.6% of its peak level during the previous cycle, SMPI on the other hand is 26.5% above its previous apex. This multifamily price surge has to a great extent banked on the success of a number of supply-constrained or tech-oriented markets with recoveries that have surpassed former peak levels by wide margins such as New York (by 71.5%), San Jose (66.1%), Portland (64.2%) and Seattle (61.5%). Frankly, though, prices for the vast majority of U.S. metros show ample positive momentum into the fall highlighted by robust 2% growth or more over the last three months for nearly 50% of the cities that we track.